For those who have not been "encountered", the idea of participating in the upcoming ME Weekend may appear to be a bit threatening. Why? Some people think that if you attend the Weekend, you're automatically admitting that something is wrong with your marriage and that can be either shameful or embarrassing. Family and friends who haven't attended may tease you about it. Others may think that because their marriage is fine, there's no need to attend a "marriage seminar". And still others believe that at the "Weekend", you will have to expose your private lives to strangers. These are the most common excuses for not wanting to attend. Unfortunately, all of these excuses are just that...excuses and not based on reality or fact. The CNMI Marriage Encounter is a warm, family-oriented organization that not only promotes strong marriages, it also enhances love and communication among couples. If you know of anyone who has been encountered, ask them about their experience! We've met many couples along the years whose marriages were saved due to the communication techniques they learned in ME. We've also heard from other couples who are back in that "romance" stage of their relationship with their spouse since they can openly share their feelings with each other. ME is for EVERYONE! It doesn't matter if your marriage is good or great, the Weekend will help you reconnect with your best friend and partner for life. 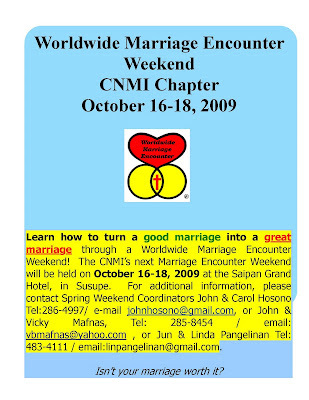 An attractive feature of the Weekend is that the Worldwide Marriage Encounter organization helps make our Saipan Weekend completely affordable: $50 per couple for two nights' stay at the Saipan Grand Hotel, including meals. If you are interested in joining, please contact John & Carol Hosono, the Fall Weekend Coordinators at 286-4997 or johnhosono@gmail.com.